Whidbey Island Center for the Arts invites the community to join with the Walkers at 7:30 p.m. on Saturday, November 21 in celebrating family, the harvest and the cycles of life. 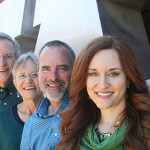 Original and traditional songs will be performed by Amy Walker, Paul Houser, Tom and Claudia Walker, and their special guests: Ben Walker, Linda Morris, Randy Hudson, Dave Bokel, and Jennifer Bondelid. An evening of heartwarming, fun-loving, and thought-provoking music by this well-known, musical Whidbey Island family awaits you. As we do our most to support our neighbors in need during this holiday season, please bring a healthy, non-perishable food item for Good Cheer and build a cornucopia of giving with the Walker family. All Seats are $22. Zech Hall’s Piano Bar opens one hour before the show.